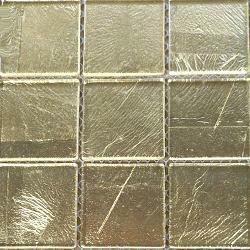 DAZZLING METALLIC 2" FOIL TILES. THESE VIBRANT COLORS VARY IN INTENSITY WITH CRINKLING SIMILAR TO LEAF VARIEGATION OR MARBLE. THESE ARE TRULY FABULOUS TILES AND MUST BE SEEN TO FULLY APPRECIATE THE UNIQUE PATTERNS MADE BY THE METAL LEAF. SIZE: 2" X 2" WITH 4MM (STANDARD) THICKNESS. 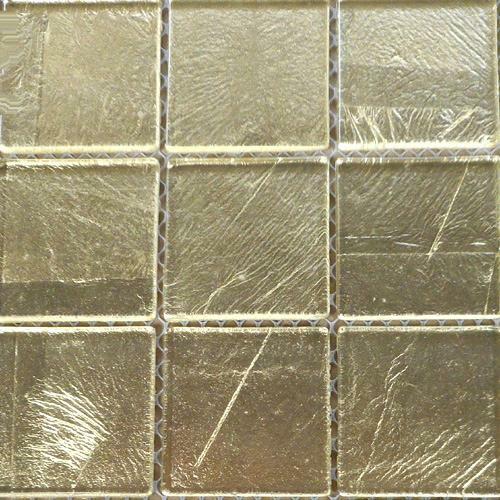 SOLD IN FULL SQUARE FOOT SHEETS MOUNTED ON MESH WITH 36 TILES PER SHEET OR 1/4 SHEETS CONTAINING 9 TILES. NOT SUITABLE FOR OUTDOOR OR STANDING WATER PROJECTS.